Okay I was going to get this until I saw the bosch deal yesterday....Still don't know which is better!!! seemed a decent deal for brushless twinset. Max Weight - 1.13kg . It seems a very good price. I am a bit confused, all reviews I could find online are with 20v batteries instead. It seems a very good price.I am a bit confused, all reviews I could find …It seems a very good price.I am a bit confused, all reviews I could find online are with 20v batteries instead. In America this is called 20v Max in U.K. it’s called 18v. They are exactly the same. The same, basically its a marketing gimmick , the 20v is max voltage vs 18v which is the nominal voltage of the battery. In America this is called 20v Max in U.K. it’s called 18v. They are e …In America this is called 20v Max in U.K. it’s called 18v. They are exactly the same. if it was sold by Screwfix or Amazon I would buy it straightaway. weird thing is ...when I was listing this I had another link to ffx and apparently they are banned. 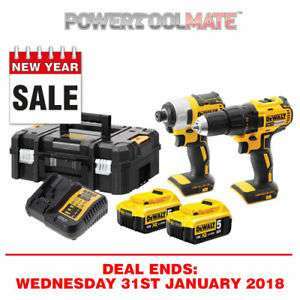 I thought they were more legit than powertoolmate, hell they are listed on the Bosch wesite as a trading partner!!! weird thing is ...when I was listing this I had another link to ffx and …weird thing is ...when I was listing this I had another link to ffx and apparently they are banned. I thought they were more legit than powertoolmate, hell they are listed on the Bosch wesite as a trading partner!!! I think some dodgy UK sellers like this are banned unlike the numerous totally reliable, tax paying, unheard of Chinese / Hong Kong retailers that constantly grace this site. yeah and check their trustpilot score...5 star out of 25,680 reviews!! I know the feeling. I have an old cheap cordless drill which still works fine. But wanted a new one anyway. Ended up buying a Dewalt DCD996 combi and DCF887 impact driver recently. Don't actually need them and probably won't use them much either.